A 32 yo male with sudden left sided weakness since 4 hrs. CT study of Brain shows faint hypodensity involving right basal ganglia and adjacent insular cortex - a subtle and subjective finding. An acute infarct with restricted diffusion involving right basal ganglia, adjacent insular cortex and right peri sylvian cerebral cortex. Area of involvement corresponds to right MCA proximal main stem territory. 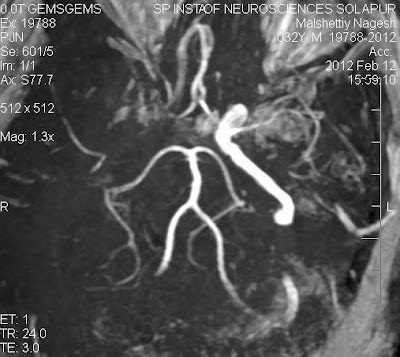 On MR Angiography right ICA - MCA not visualized implies to occlusion. Right ACA filled from contra lateral anterior circulation via Acom. 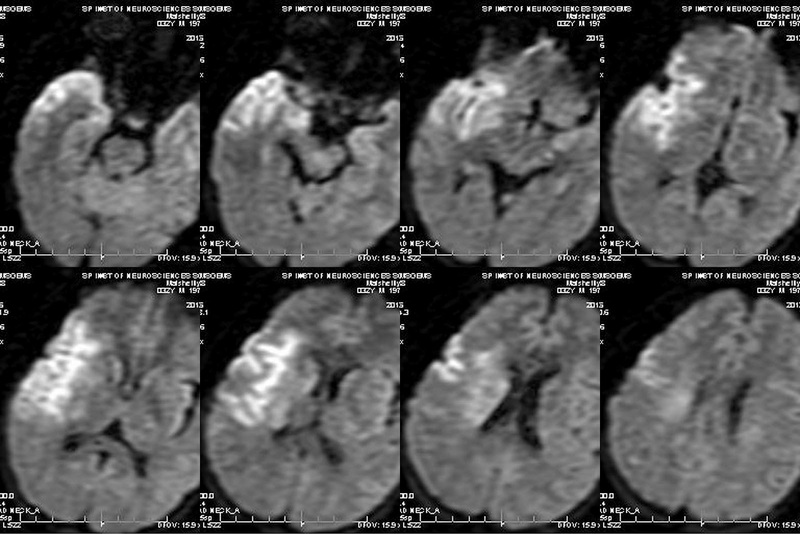 Imaging diagnosis : Acute infarct right MCA proximal main stem territory secondary to right ICA - MCA occlusion. Infarcted tissue on CT seen as an area of low attenuation due to cytotoxic edema that develops in the region of infarct as a result of ATP ionic pump failure. An increase of water content of brain tissue by 1% will decrease CT attenuation by ~2.5 HU. 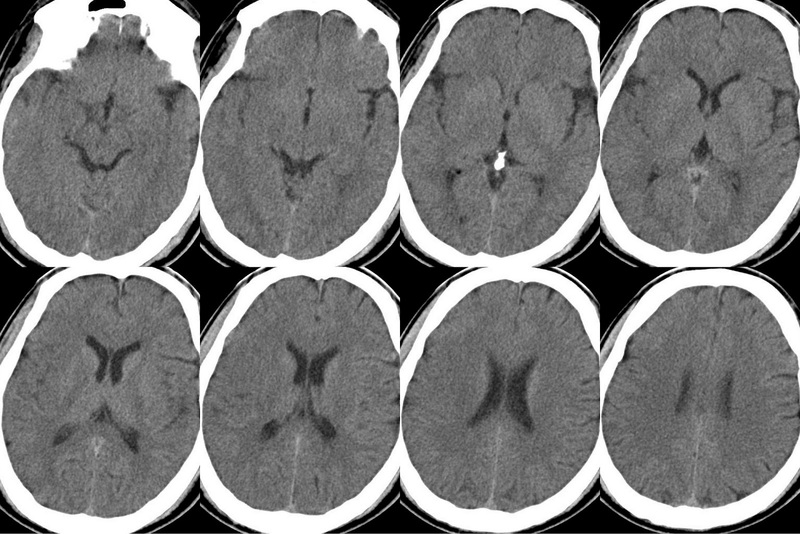 Hypoattenuation on CT is highly specific for irreversible ischemic brain damage if it is detected within first 6 hours, and implies to larger volume infarct, more severe symptoms, less favorable clinical courses and proneness for hemorrhage. Therefore if infarct is seen on CT means bad news. No hypodensity on CT is a good sign indicates reversible ischemic brain damage. 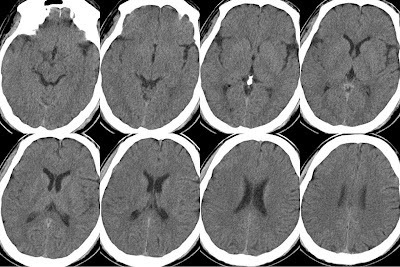 On CT 60% of infarcts are seen within 3-6 hrs and virtually all are seen in 24 hours. The overall sensitivity of CT to diagnose stroke is 64% and the specificity is 85%. The most sensitive sequence for acute ischemic stroke, works on principle of restriction of Brownian motion of extracellular water due to imbalance caused by ion pump failure and cytotoxic edema. 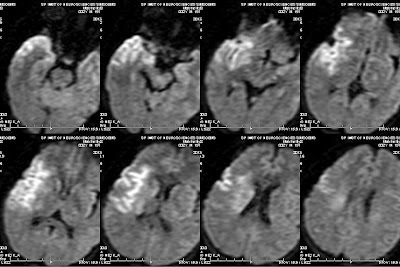 Comparison of diffusion-weighted MRI and CT in acute stroke. On DWI the acute lesion identified correctly in all instances and on CT it was identified correctly in 42 to 63% of patients. Sensitivity for detection of more than 33% MCA involvement was better for DWI (57 to 86%) than for CT (14 to 43%), whereas specificity obviously high with MRI Diffusion. Diffusion is the most sensitive and specific sequence. Not even compared to CT, more practicle compared to CT and MRI Perfusion imaging in acute ischemic stroke where time is very precious. Each second represent one neuron.